To understand the fights between the Guelphs and the Ghibellines in Florence Italy, we need to go back to 1216. In 1216, Florence Italy is an expanding city. With most of Europe ruled by the feudal system, northern Italy is an exception. Cities become powerful and dominate the rural areas. They attack the feudal lords and take their possessions. The feudal lords originate from ancient families of noble origins, most of them from Germany, where the Holy Roman Emperor granted their privileges. With cities, including Florence, becoming more powerful, these lords either choose to become citizens or are forced to do so. This creates an explosive situation: ancient noble families from Italy (Guelphs), used to live in cities, and ancient noble families from Germany (Ghibellines), used to dominate a feud, all in one place. Both want to take advantage of the new opportunities: becoming incredibly rich is relatively easy, thanks to the superior technology Florence had in weaving, but you know, money is nothing without power. 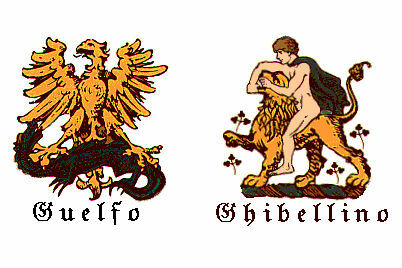 These two words are not Italian words, but an “italianization” of two German words: Welf and Waiblingen. These words are related to the conflicts for the succession as Holy Roman Emperor: the house of Welf was trying to take over the legitimate reigning family,while Waiblingen is a rallying cry used by the troops of the Emperor. Guelphs and Ghibellines meant, respectively, “against” and “in favor” of the Emperor. And since the worst enemy of the Emperor, at that time, was the Papacy, Guelphs soon meant “in favor of the Pope”. It’s almost natural that the ancient Italian families were Guelphs, supporting the Pope, while the ancient German families were Ghibellines, supporting the Emperor. In January 1216, Mazzingo de Mazzinghi hosted a party in his castle in Campi Bisenzio, inviting all the Florentine aristocracy. A jester took away the dishes of Buondelmonte Buondelmonti and Uberto degli Infangati. Buondelmonte became nervous and another guest, Odarrigo de Fifanti, accused Uberto of the missing dish. Uberto answered: “you lie for gluttony!”, meaning that it was Odarrigo to steal the dish in order to eat their meal. There was a brawl and Buondelmonte wounded Odarrigo. To pacify the situation, later the families agreed on a marriage: Buondelmonte would marry a niece of Odarrigo. Problem is that Gualdrada Donati, who liked Buondelmonte as the perfect husband for her daughter, offered the young man to pay his penalty for breaking the marriage contract. Buondelmonte, who liked the new potential girlfriend much more, accepted the offer. Odarrigo’s niece in vain waited for Buondelmonte at the altar and this was considered an insult, worth revenge. The day of Easter 1216, Buondelmonte entered in Florence riding a horse from Ponte Vecchio, elegantly clothed, ready for his marriage with the new girlfriend. Odarrigo’s family and their friends hit him with a stick, he fell and was stabbed to death. The city split in two, favoring either a faction or another: it is the start of the fights between Guelphs and Ghibellines. Guelphs and Ghibellines will alternatively rule Florence for about one century, in the age of Dante Alighieri. Each time a faction took over, the families of the other faction were exiled and their properties burned. The famous poet was involved in these fights, participating, on the Guelph side, to the decisive battle of Campaldino (1289), which is where the Guelphs claimed a conclusive victory. This battle ended the fights between Guelphs and Ghibellines in Florence, but the winning party, the Guelphs, split again in two factions, Black and White. Black Guelphs, helped by the Papacy, took control of the city and Dante Alighieri, partying for the White side, was banished himself. His famous poem, the Divine Comedy, was not written in Florence, because Dante never came back.